Eliminate those chilly spots in your home, those uncomfortable spaces where the heat just never seems to make it, with an innovative, efficient heating system from Unico. The Unico iSeries pairs an efficient outdoor unit with at least one indoor wall split. Ideal for providing heating and cooling to additions, garages, and other unique zones, the iSeries may also be part of a whole-home installation from Unico. It’s a fact of life in many homes: Though the heating system may be doing a fine job overall, one room or a couple of them stubbornly remain chilly, failing to reach the same level of comfort enjoyed in the rest of the home. Whether the problem plagues the attic bedroom or a garage-turned-workshop, homeowners try any number of would-be solutions, but it’s usually a frustrating quest. Space heaters, for example, may be convenient, but they can also be very expensive to run (not to mention a fire hazard). Piling on layers of sweaters and blankets? That may do the trick in a pinch, but it’s hardly a permanent fix. The good news is that just as technology has revolutionized other product categories, it’s also brought welcome innovation to the world of heating and cooling. As a consequence, homeowners may now choose from a wide array of compelling options. 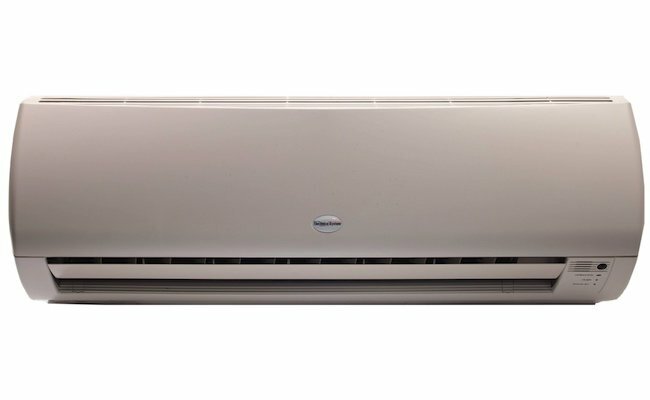 Perhaps most exciting are the ductless mini-split systems already popular in Europe and Asia, and winning more and more converts here. Whether they’re delivering climate control to one room or every room in the house, ductless systems like the Unico iSeries are efficient, high-performing, and versatile solutions for any home. Ease of installation gives the iSeries a leg up. In most cases, chances are that extending or otherwise modifying your heating system would require significant renovation. That’s in no small part due to the significant bulk of traditional, full-size ducts. 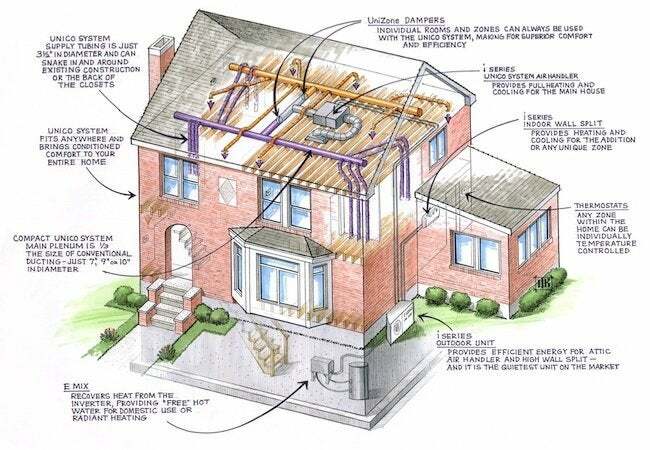 It’s no easy feat to fit ductwork into an existing home. Though the iSeries can pair seamlessly with the small-duct Unico System, it doesn’t have to involve any ductwork whatsoever. With a compact, streamlined design, the system lends itself to easy, noninvasive installation, enabling homeowners to sidestep the challenges a larger project would pose. The Unico iSeries outdoor inverter can support up to four indoor heating and cool units. It can also connect to the Unico System, which offers a non-intrusive, virtually invisible whole-home solution for year-round comfort. 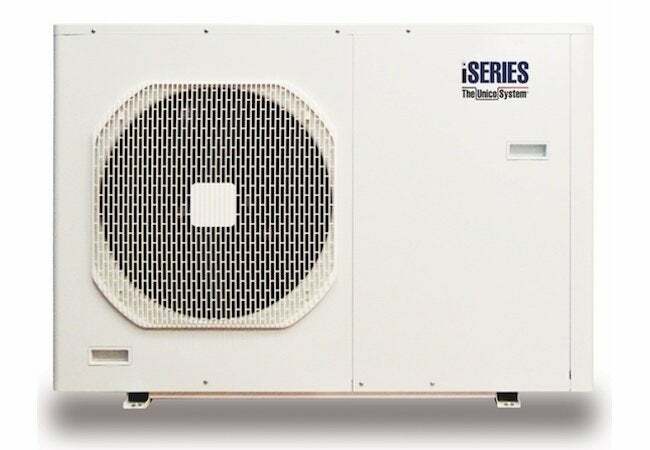 At its most basic, the iSeries includes two components—an indoor unit and an outdoor inverter. The latter works in an ingenious way. In winter, it harvests heat from the air—even when it’s -25 degrees outside—and sends it indoors. In summer, the system does the opposite, taking heat from the home and expelling it outside. In any season, the inverter achieves stellar efficiency by avoiding one of the energy-hungry hallmarks of traditional HVAC—cycling on and off. Instead, the iSeries saves energy (and dollars) by operating continuously at a low power level. It’s a common homeowner complaint that heating costs a small fortune, but with the efficiency of the iSeries components, that doesn’t have to be the case. While the outdoor unit employs technology to save you money, the indoor unit does so to keep you comfortable. For starters, its fan eliminates hot and cool spots by ensuring even air distribution. And because the iSeries mounts within the space it’s conditioning, it can monitor the environment and auto-adjust its output to match the demand. Together, these features work to keep the temperature from deviating—in other words, you always get the temperature you expect. Older climate-control systems create rollercoaster-like temperature swings; the iSeries provides reliable, even warmth. Part of the iSeries ductless system from Unico, the indoor unit efficiently and quietly delivers heating and cooling to those peripheral spaces in the home that never seem to reach a comfortable temperature. Worried about noise? Don’t be. Besides being unobtrusive enough to mount in a tight or out-of-the-way part of a room—say, above the door—iSeries indoor units operate at a remarkably low volume. In fact, they are virtually silent, generating no more than 23 decibels—approximately the sound of a soft whisper. Traditional heating options call attention to themselves—they tend to be bulky and unsightly or cause a racket. In contrast, the discreet iSeries offends neither eyes nor ears. You don’t notice it working; you notice only that your once-chilly room now feels cozy. The benefits of the iSeries become even more apparent if you install multiple indoor units, a perfectly reasonable choice given that one outdoor inverter can support up to four indoor units. You’re probably most familiar with heating systems where a single thermostat controls the temperature of the entire house. With multiple indoor units, however, you can establish multiple zones, controlling each one independently. That way, people with different preferences can all be comfortable under the same roof. Plus, you can turn off the indoor unit—saving energy dollars—in any zone you’re not occupying. For your comfort and your wallet, zoning makes a lot of sense! If persistent indoor discomfort has led you to reassess your HVAC needs—or if you’re building a new home or addition—seize this chance to look beyond the familiar standbys. Cost-effective, nonintrusive, and remarkably versatile, the Unico iSeries may be the perfect solution that, until now, you never knew existed. Remember this too: Where you shiver in winter, you are likely to sweat in the summer. Because the iSeries delivers not only heating, but cooling as well, it can help you reclaim the areas of your home that you’ve been avoiding at certain times of the year. Who knows? Those rooms may become your favorite of all!